Costa Smeralda offers modern facilities thus ensuring the best stay possible to you. Build on a beautiful slope it provides a unique view of the Ionian Sea with its crystal clear waters and also stylish and luxurious modern rooms. The hotel is only 5 minutes away on foot from Bella Vraka Beach. Guests can use the 20 m stone paved path to the private beach, equipped with a wooden platform offering free sun beds and umbrellas. At distance of 500m from the hotel you have the chance to visit the various bars and supermarkets. At the port of Syvota there are many tavernas to choose from where you can have the opportunity to try fresh fish. 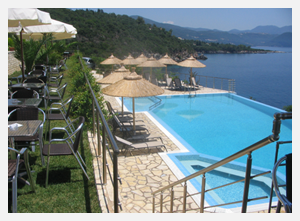 Our hotel is a favourite location of visitors to Sivota and the surrounding area. It is a preferered choice for couples and families , and for this reason we are usually given high evaluations. Free parking is available to all our guests. In addition our beach offers water sports.